My sister and nephew came over today to help with hauling mulch in the front garden. My nephew spent most of his time zipping around in his tractor, playing with the dogs, and playing in a kiddie sprinkler. He did, however, help me spread hay over a reseeded area, throwing the hay with gusto – and getting it in his hair and all over Einstein, who of course had to see what we were doing. 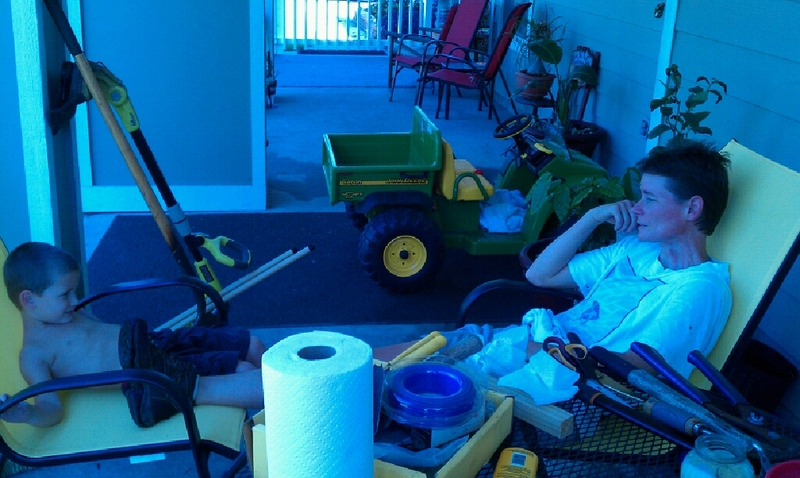 This was taken by my sister as we took a break, discussing his need to play Wii while we were finishing up the day. Weather: again just over 90 degrees, no rain, few clouds beyond the massive, towering clouds that I saw on the way back from the NOC. They were just teasing. Still humid. The weekend forecast shows a drop of 10 degrees for the high, so we may actually be moving toward fall – but not too much, please, since I have tomatoes and peppers out there still. Plants: more peas coming up. Dug up a couple of sweet potatoes for roasted red pepper soup yesterday, and they don’t look too bad. Also picked some jalapenos for that soup as well. Done: built two more doubled frames, pulled the black eyed peas from the middle area, refertilized with chicken poop, moved the empty trellises to the back, pulled some random weeds. At the NOC, racked up another new server, reinstalled two others, one for production, one as a current testbed. Weather: another hot, humid day. High at the ranch was 93 officially by the front garden, but it felt like that by 10 AM already. By the time we reached the actual temp high, the heat index was around 110 degrees. Rain in the very late afternoon for about 20 minutes or so. Plants: the pepper plants in the front garden area where the garlic had been are looking very good. Chocolate bells, jalapenos, and paprikas are all forming nicely. No sign of pea germination, but cooler weather is coming next weekend, and they should like that. Beets have sprouted, along with the mustard, leeks, and cabbage. Done: transplanted out another 48 bell peppers, sowed another frame of green beans. Weeded, weeded, weeded. Watered almost all the trees throughout the day. Sowed four types of squash to replace the ones killed off by vine borers. This time, a special method that will hopefully keep the critters away (pictures later). Started laying the used coffee bags around the tomato transplant, to be followed by a layer of hay. Weather: topped out at 92, according to the weather station here on the ranch. High humidity all day long, which made it feel like a sauna just stepping outside, not to mention what it felt like when there was actual work happening. About 3 PM, thunder rumbling in the distance, but no rain here at the ranch, and the skies to the east cleared by 5 PM. Plants: the front crop of peanuts is starting to fall over, which means it’s nearly harvest and curing time for those. The spinach sowed in a couple of 4×4 frames in the front garden is coming up. All of the melons look terrible and should probably be taken out for compost. Still no new sweet basil seedlings from that direct sowing – the second direct sowing, in fact – which is very strange given that it usually grows like a weed. Done: Weeded, a job that never seems to end. Transplanted 64 cherokee purple tomato plants from the flats, and 32 bell peppers. Reseeded more dud green beans. Ran drip irrigation in the final row of the back garden to replace the traditional irrigation that had been there. Topped the lemon and lime basils in the herb garden. Watered everything except the trees. Replaced one of the watering timers, which picked today to go crazy. Sliced open half a dozen used burlap coffee bags so they can be used for moisture and weed control around the transplanted tomatoes and peppers from today. Picked and tested some of the second round black eyed peas from the front garden. Relaid the black plastic mulch in the front garden that had blown around a bit. Checked for the spider that hangs around the front walkway on the siding, but couldn’t find her; her three egg sacs are still in place. It’s difficult to know when the seasons change here, as it can be rather abrupt (witness our move from about 80 as a high to a high of 100 in the span of three days back in “spring”). Just in time for fall, though, we have an actual slide into the season: instead of highs hovering right around 100, it’s hovering right around 90 instead. Still not enough of a “fall” for the garlic to be planted, but cool enough – relatively speaking – to get the second cropping of tomatoes and peppers in. This morning I set out 64 cherokee tomato plants and 32 bell pepper plants. There are more of each to plant, plus the brassicas, which I intend to use floating row cover on to keep the bugs away. Combine that with another round of weeding, running some irrigation, replacing one of the watering timers, and topping off the lime and lemon basils, and it’s been a productive day already. The benefit of starting off at sunrise is that it gives you a long day to get work done. Even with a break for lunch and working the business in between. Servers conspired to keep me out of the garden and inside or at the NOC, including a marathon session at the NOC on Thursday. While working in the outer vestibule, a storm rolled through, with a quick, bright flash of lightning followed by a tremendous rumble of thunder that shook the front windows. Luckily I was in the one place guaranteed not to lose power while I was working on a balky server. Weather: highs about 90, little rain. Last night again lightning and thunder in the distance, but bypassing the ranch. This means watering rounds on Saturday. Plants: Saturday will be the attempt to plant out the flats. The forecast is for more of the same of this sort of weather, so the garlic planting will have to wait a bit, until the temps are consistently not hovering around 90 every day. This will also give me time to clear out two more frames that will eventually hold garlic. Done: Nothing, alas, as I spent my days up to my eyeballs in servers, either putting in new ones or dealing with old ones. The week ahead will surely be better. Weather: high around 90, some rain (hooray!). Nothing done today. Between mom’s birthday and dealing with two brand new servers where the NICs didn’t want to cooperate and talk on the network, there was no time for anything else. Tomorrow is another day, as Scarlett would say. Weather: high around 85, a bit over 3/10 of an inch of rain. Storms breaking around us here – lots of sound and fury, but not enough rain. Plants: Peanuts keep popping up in frames where we pulled them, leftovers from that harvest. Left them for now. The first okra plants are nearing 6′ tall, the second round at 4′ now. These are to be pulled, as we’re over okra for the season. Done: Completed weeding the garlic frames and fertilized in prep for planting. Two frames still taken up by pepper plants that seem to be enjoying the (relatively) moderated temperatures. In the rear garden, the last row of frames is completely weeded. Sowed three types of shelling peas and replaced the dud green bush beans with new seed. Realigned the drip irrigation that was out of place from the pulling of the black eyed peas.